Whether you’re a family that likes to have some fun meals together or you’re a host wanting to have a fun party, one way to do it is to have every person make his or her own mini pizzas. That way, each person can customize the toppings and they can decide whether the pizza should be just slightly done or extra crunchy. It’s a fun way for family members or guests to interact with each other and no single person gets stuck with all the cooking. Picky eaters can’t complain about the anchovies anymore! Our Pizzarette Countertop Pizza Oven review will delve into whether this product can successfully help put together this kind of meal. Pizzarette – “The World’s Funnest Pizza Oven” – is an electric countertop mini pizza maker that up to 4 or 6 people can use at the same time to make their individual pizzas. You set it on a tabletop, plug it in to heat up, and slide one or more mini pizzas through the portholes and onto the baking plate. After 5-7 minutes, the pizzas are done and the next round can then be cooked too. Since each round of pizza baking is quick, one Pizzarette can handle several guests at a party without anyone having to wait their turn too long. It really is a great tool to have at a party. Impatient kids can participate in the meal without having time to get bored. The real terracotta dome makes the Pizzarette a nice party table centerpiece and imparts good flavour to the pizzas! The Pizzarette comes in three different models. The Classic 4 Person Model measures 15 x 15 x 10 inches and is perfect for a family of 4 or a small gathering, while the Classic 6 Person Model measures 16 x 16 x 14 inches and is good for a larger family or gathering. Both of those come with a non-stick base pan. The third model has a proper stone base plate, is also for 6 people and measures 18 x 18 x 12 inches. It imparts a hint of smokiness to the crust. Let’s go into more detail about how a Pizzarette works and what the various features are. We’ll also examine its advantages and drawbacks to help you determine if one of these models will be a good addition to your kitchen. Classic 4 Person Model: A removable non-stick baking plate, 3 black plastic spatulas and 1 stainless steel spatula. Classic 6 Person Model: A removable non-stick baking plate, 5 black plastic spatulas and 1 stainless steel spatula. 4 Person Model with True Baking Stone: A removable stone baking plate, 5 black plastic spatulas and 1 stainless steel spatula. 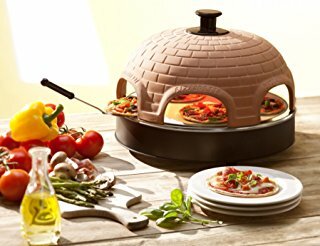 The Pizzaretta Oven has two parts to it – a terracotta dome that covers the pizzas and a base unit with one heating element underneath and another floating heating element above. There are no controls or even an on/off switch on it. You just place the baking plate over the base, cover it with the dome, plug the unit in and it will start heating. It will be hot enough to start baking in 15 minutes. After rolling out the pizza dough, use the included dough ring cutter to cut out 4.5″ circles, and get as many as possible ready for everyone to add toppings to. In order to prevent the circles from sticking to each other, flour each of them generously. Also use a cooking spray for the baking pan or brush it lightly with some oil. Have each person build their mini pizzas by placing each dough circle on one on the spatulas and start spreading and loading them with their favorite toppings. If you use a plastic spatula you have to slide the constructed pizza onto the baking plate with the help of a fork and leave it in there to cook. When it’s done, use the spatula to slide it out. If you use the stainless steel one you can leave the spatula and the pizza on it inside and just remove the spatula along with it once it’s done. Cooking time can vary depending on how thick the dough is and the amount of toppings added, but no pizza should take more than 10 minutes, with 5 being the usual minimum. Once one pizza is taken out, another one can be inserted in immediately. When the pizza party is over, leave the unit to cool completely before cleanup. Remove the non-stick baking pan or stone for easy cleaning. If there’s any food stuck on, just soak the pan in water for a few minutes and gently wash with soap and water. The stone pan may need more thorough scrubbing. The rest of the unit can be just wiped clean with a damp cloth and the whole thing can go into a pantry for storage or left on a countertop. This is a unique concept that works very well for parties for kids and adults. The host has less work to do and each guest can customize their pizza and experience more variety with each one. Picky eaters and those with food allergies can avoid specific toppings. Much smaller than a regular countertop oven so storage is easier. The dual heating elements ensure even and fast baking from above and below. Authentic flavor because of the terracotta dome. You can make regular sized pizzas too just to enhance its usefulness and value. However, you have to remove the dome to place and remove the pizza from the pan. When you buy a Pizzarette set only one person can use the stainless steel spatula at a time, and since it’s the only one that can be left inside the oven with the pizza cooking on top of it, it means that the rest of the cooks have to get their pizzas off their plastic spatulas and directly onto the baking plate. When doing this, you have to be careful to keep the uncooked pizza as flat as possible to avoid toppings spilling out onto the plate and creating a sizzling mess. This can be avoided by not overloading each crust with toppings but this is a little tough for mini pizzas. You should also ensure that the crusts are well floured so that there’s no sticking when sliding the uncooked pizza off the spatula. Be careful not to handle the hot dome without mittens even if it’s by the knob on top. You may find that the edges don’t cook evenly because a little air flows through the openings as the pizzas cook. The edges facing towards the middle may brown faster than the ones facing outwards. This may force you to turn each pizza 180° halfway through. To solve the problem of having just one spatula that can be left in the oven, you might want to buy additional metal spatulas or this pair of deep dish pans also made by the same brand. Not only does it let you make deep crust mini pizzas without risking toppings falling off so easily, but you can make other baked foods as well. If you eat regular sized pizzas more often, then get a full sized electric countertop pizza maker for your kitchen instead.